I tackled another piece of furniture this past couple weeks. My grandmother’s (aka Nana) desk is one of my heart pieces of furniture. It sat in my Nana’s apartment for years- I recall when she bought it- from Sloane’s furniture in Bethesda, MD. She placed it on the wall in the living room that contained the kitchen on the other side. When you opened the door into her apartment the desk was one of the first pieces you would see. I often saw her sitting there writing checks to pay the bills. I remember her stuffing the envelopes and licking both the envelope closed and the stamp to place on the envelope. This was before the days where we had self adhesive stamps. I can picture this as if it was just yesterday. I loved that desk. I marveled over it. A small secretary desk that didn’t take up much space but seemed to hold so much. When my Nana passed away in 1987 I was 23 and living with her at the time. I was dealing with a chronic illness and I was not working. I was profoundly sad at losing her. She was my best friend. I had never lost anyone I loved before to death. It was on the whole a very hard time in my life. A couple months after she passed I found out her condo was being sold by the relative that had bought it for Nana to live in years before. I asked my dad to buy it and rent it to me after the relative said they only wanted to sell it. My dad didn’t want to buy it – and that may have been the biggest blessing for me- bc to live there was living in memories so thick that I was drowning in sorrow. So I had to move. I needed to live my life. 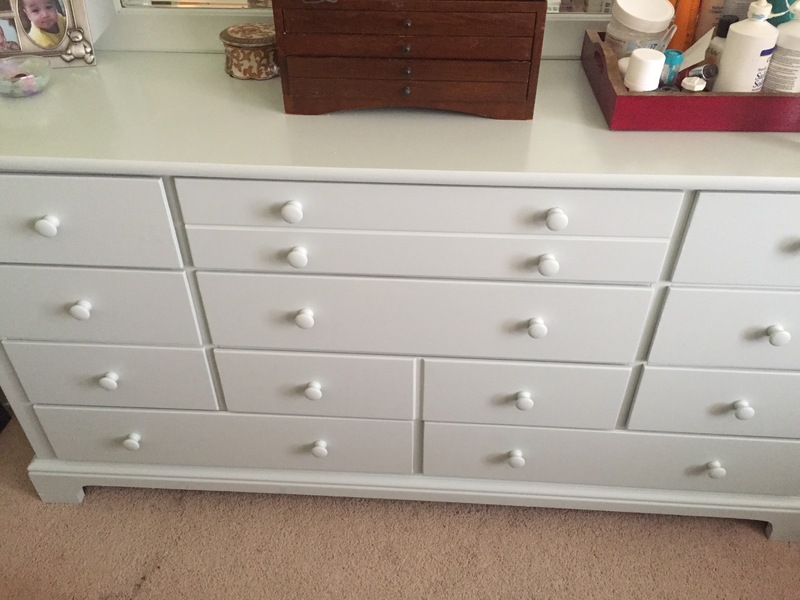 My dad decided to sell and give away some of her furniture. He offered a bedroom set to me knowing i didn’t have one. I had just rented a room in a house from a friend and had just found a job that would actually lead me in an odd route to my career as a software engineer. 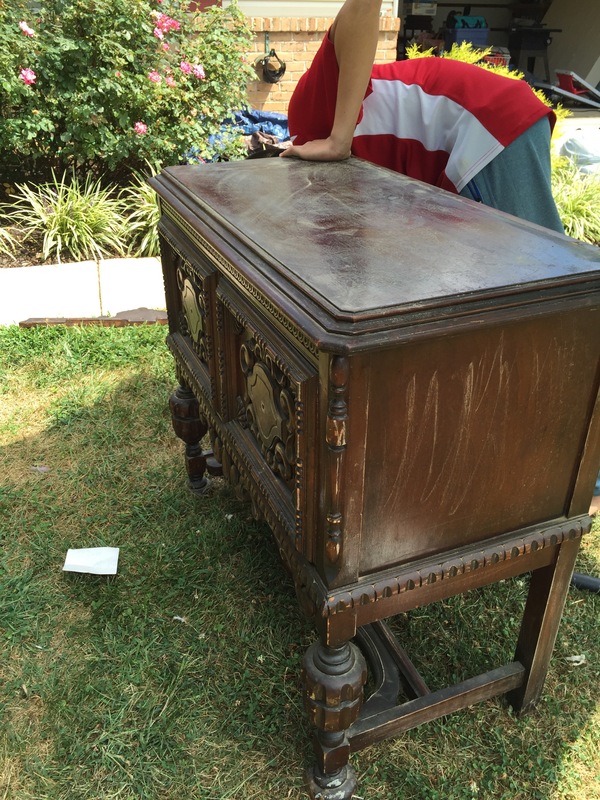 I didn’t take him up on the old ornate dresser he offered – in hindsight I wish I had. I told him I wanted my nana’s buffet, her gate leg table and her desk. Well, he knew I didn’t have room for any of that where I was going. So he took the pieces and placed them in his own home. They would follow him through a couple moves. After the loss of his wife a few years later he moved to an interim apartment while he built a home in Florida. When that move happened I was finally settled in an condo that I owned and the gate leg table and hutch came to me. Dad must have loved that desk too because it mades its way to Florida with him. That was ok, I knew I would have it someday. Someday came sooner than I thought. My dad became tired of living in a big Floridian house and he decided to downsize into a condo. He asked me if I wanted some furniture and part of that booty was my Nana’s desk. Finally it would become mine. By this time I was married and living in a a home in Mount Airy, MD. My Nana had been gone almost 15 years. I remember the desk was delivered in a box with its legs detached. It survived a long trip from Florida well. We unpacked it and placed it upstairs on our open landing. You could see it when you opened the door if you looked up. I could see it from my bed if our door was open as it often was because we had little kids. I would sometimes look at that desk and I would see Nana sitting there on the old chair reading over something- and I would smile. That desk survived the move to our farm and was placed again right where you could see it when the front door opened. When we moved in the owner of the home had an old grandfather clock in the space where Nana’s desk was going to go. He asked if I would like to keep the clock. I said “No I already have plans for that space.” I had placed that desk there in my mind before we even moved in. We have been here over five years and that desk has sat majestically in that spot- but it was getting a bit worn. 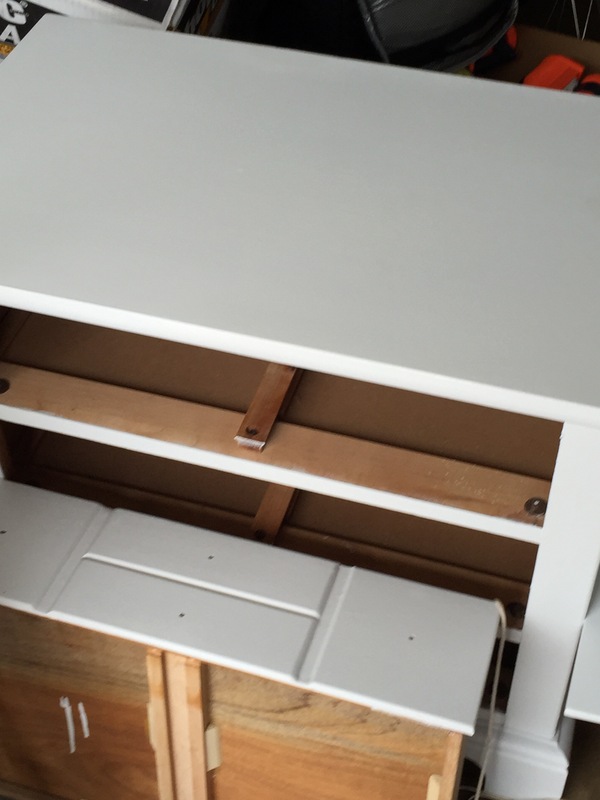 I never thought I would take paint to that desk but the desk wasn’t an antique really – but the wood top had finish that was splitting – and it was saying boring to me – it never had before but now it was. 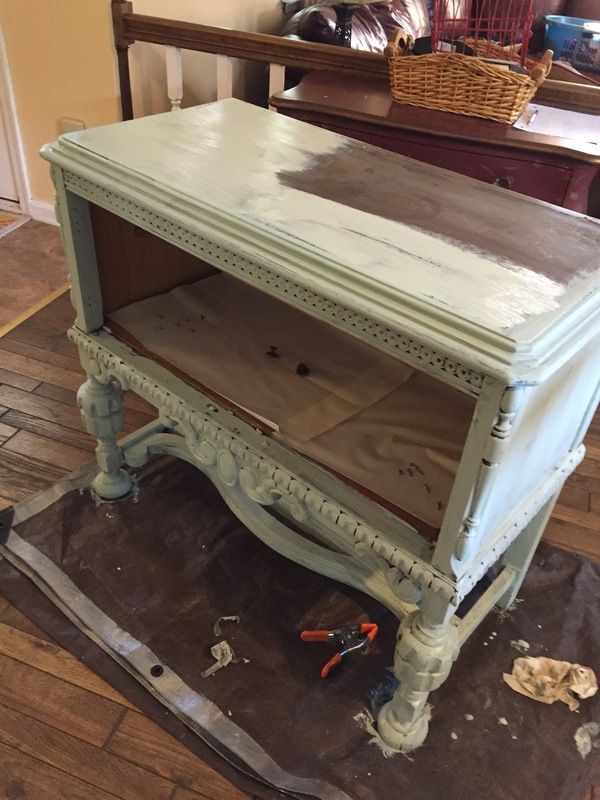 I waited a while on painting this piece – but once I tackled my Nana’s side board I knew it was only a matter of time before I painted the desk. 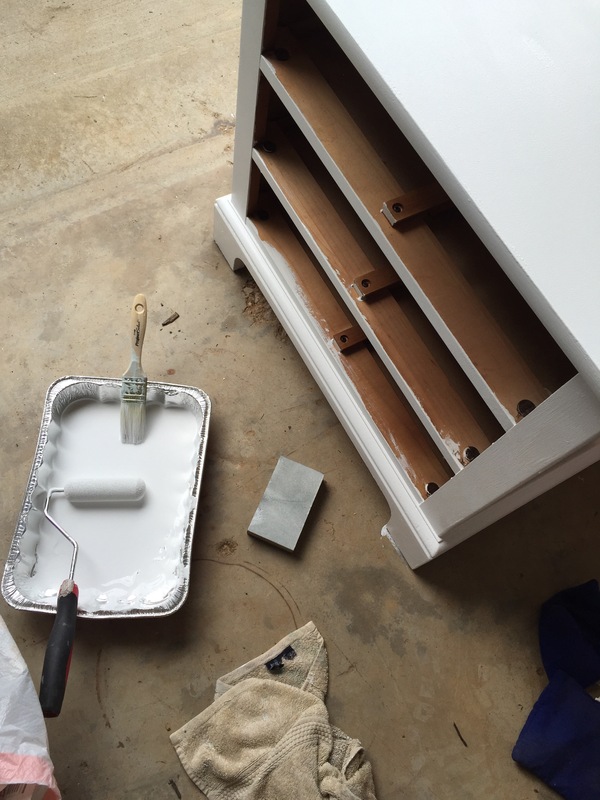 So a couple weeks ago I walked up to the desk with a paintbrush full of white chalk paint. And I looked at the desk and I swiped it with paint. I felt ok. I removed the jade lamp (also from my Nana) and the other odds and ends that sat on the top- we pulled it from the wall and the painting commenced. I changed my mind on the color and then wanted to add patina. I added too much..the desk and I fought for a while. I was scaring myself that I had really messed this one up and to a piece that I loved. I panicked a little – but in the end I think the struggles were worth it. I love the end result. And yet again I learned much. I did not paint the inside yet. I wanted to leave some of the original finish uncovered for now- I didn’t want to cover up all the surfaces that Nana had touched just yet. I might paint the inside gray later and add a chalkboard finish on the desk when its it open. I plan on this piece following me to my next home and there it will have a prominent spot- maybe even a place where you it can be seen right when you walk in the front door. Began again with Jolie Blonde – 3 coats. Tried a glaze on the back and nope not good. Used Organza Creme (leaves a metallic sheen kind of) in Pewter and I used too much and hated the effect. So I went back over the piece with some of the yellow paint and kept working with it (painting it on and wiping off if needed) until I got the effect I wanted. Used three coats of light brown wax (2 coats on legs) and when dry I buffed with a #0000 steel wool. 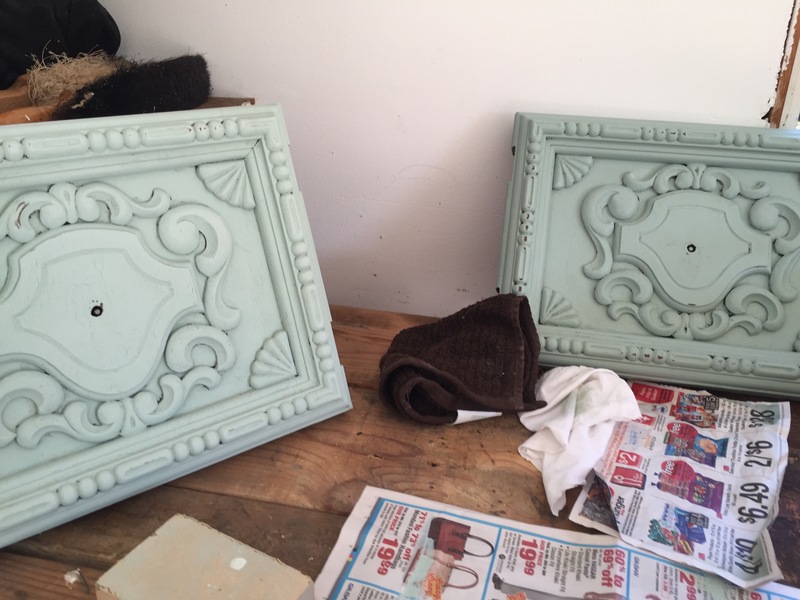 I “antiqued” the hardware by painting over it and then painting with a glaze in coal tar color. 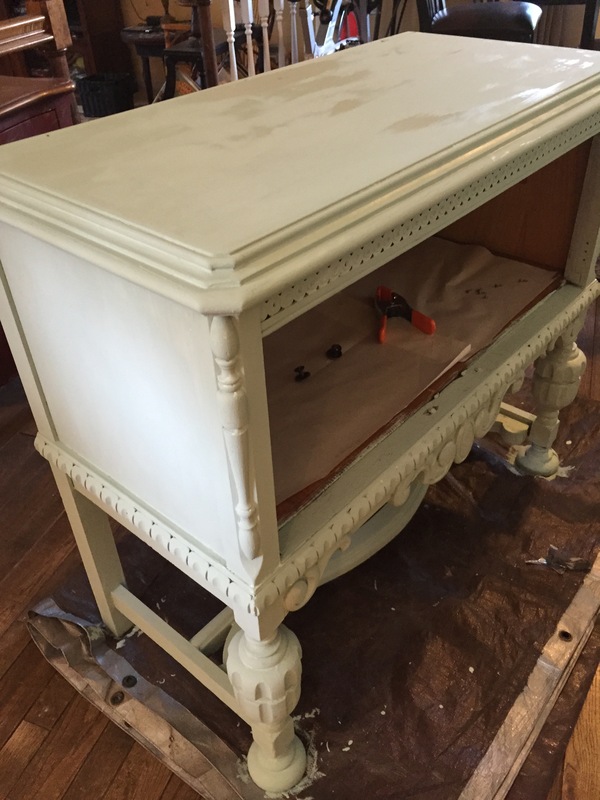 My latest furniture painting victim is a tea cart I got from my sister-in-law Leslie. It was in her family I think for a good while. She didn’t have room for it anymore and asked if we wanted it. 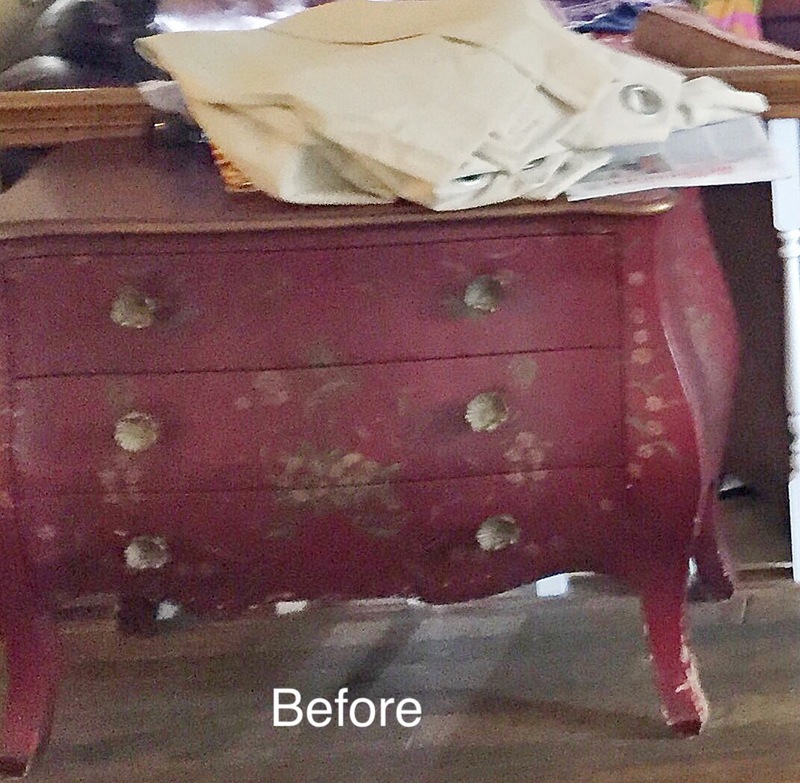 I am not sure she knew we would transform this piece and maybe that is better…often we get used to seeing a piece of furniture in one way and it might seem horrifying to think of it being painted over and transformed anew. I did send her photos as the transformation was underway and she was sent back her thumbs up. This was one of those projects that took a while. 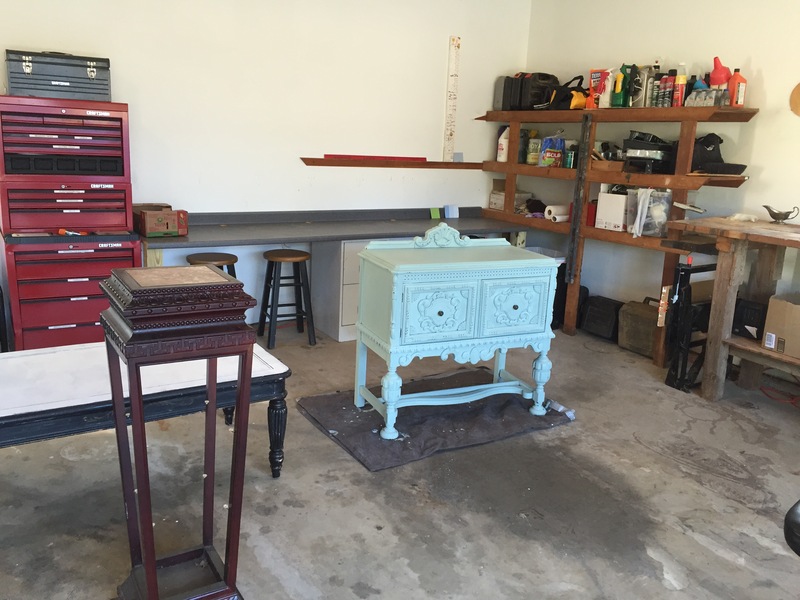 I began last fall in the garage/studio. But the weather turned cold and I didn’t want to work out there – plus paint dries slowly in cold as I learned on a couple short attempts to work on the cart on cold days. I was able to get it nearly complete out there thanks to some indian summer days. The project got tabled (no pun intended) for a while over the holidays and early into the year. The top of the cart was ready for its last coat of paint so I got inspired and asked my husband to bring it inside so I could work in the warmth of the house. 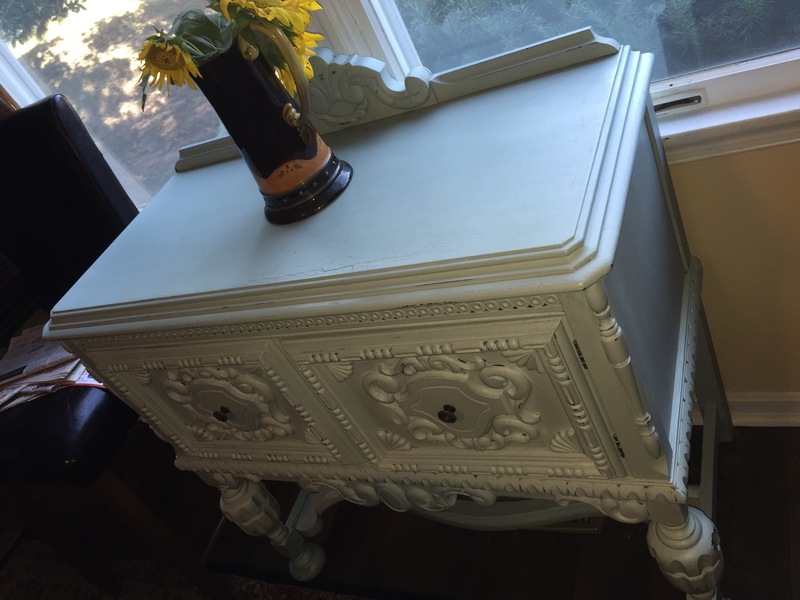 Originally, I wasn’t going to paint inside the house but one day in January I looked at an old piece of furniture and I realized I needed to paint it bc I really didn’t like looking at it anymore (see my post on that project here) and I brought paints in from the garage and painted the small chest into a new piece that I now liked again. So the painting studio had moved inside. 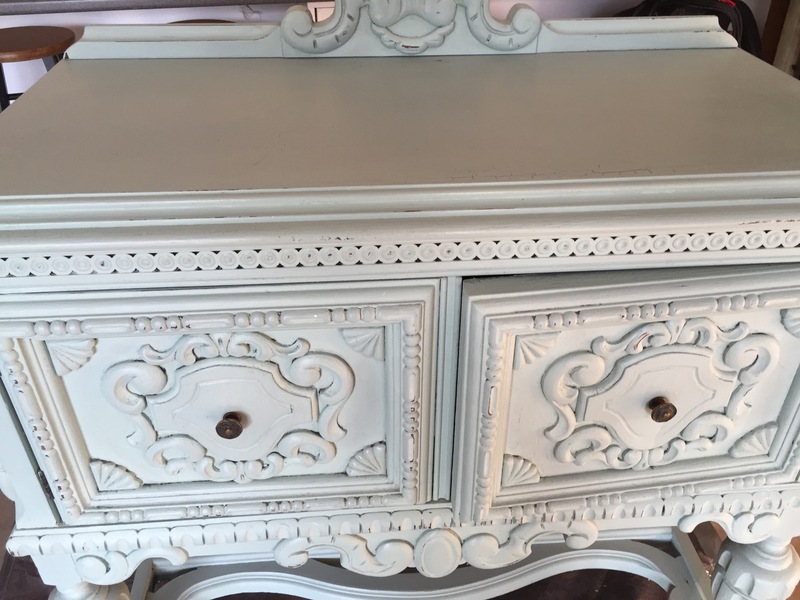 Chalk paint has no odor so nobody was being bothered by the smells- but the clutter – well – thats another thing entirely. I certainly am not the biggest messer-upper in this home so I will not listen to any complaints about my paints and supplies covering our dining room table! And the TV is not blocked in any way so all is ok in Sweeneyland. For the tea cart I had an inspiration piece that I found online. I wanted to just have at it with no cheating(surfing the net for ideas) but I had no idea what I could do with a tea cart. I also thought there might be some way to deconstruct it and make it into something else – but as soon as I saw this picture below I decided I wanted to do something like this. Inspiration Piece- loved the red wheels! 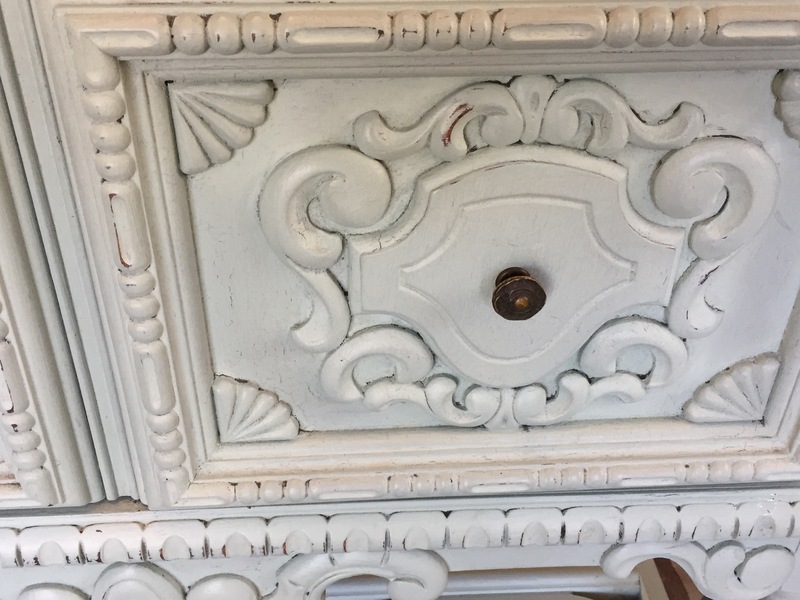 I used Maison Blanche Paints and for this project I used their Maison White – which is whiter than the paint in this picture – in hindsight I might have used their Vanilla color but I like my results. I also used a grey color called Hurricane as the base coat on the top. I crackled the top using their Crackle Extreme product. The top coat is the Maison White which cracked well and exposed the Hurricane color underneath. Took apart the piece as much as I could and wiped it down to get all the dust off. 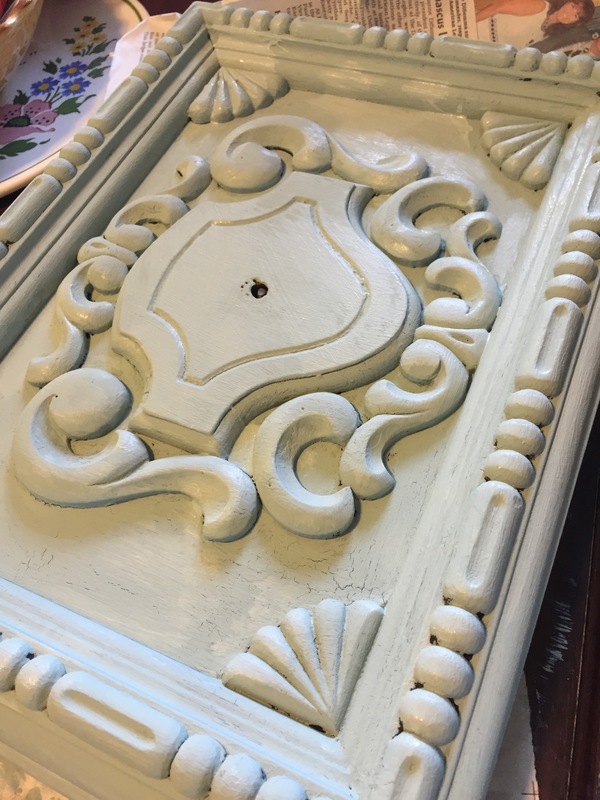 NO Sanding needed with this chalk paint and so far that has rung true. 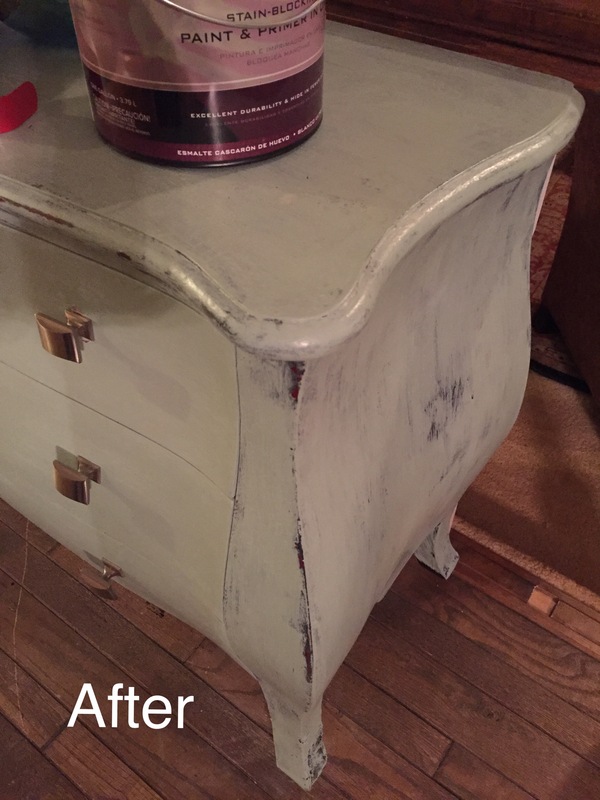 I began with the bottom part and painted it with three coats of Maison White. I distressed it using a medium grit sanding block. Mine dried for at least a week bc I was taking my time- but it can be distressed within a couple hours of drying even sooner probably. I added a stencil and after it dried I distressed some more. I then varnished it with two coats of Maison Blanche Varnish. I didn’t feel like waxing this piece and I like the varnish finish. 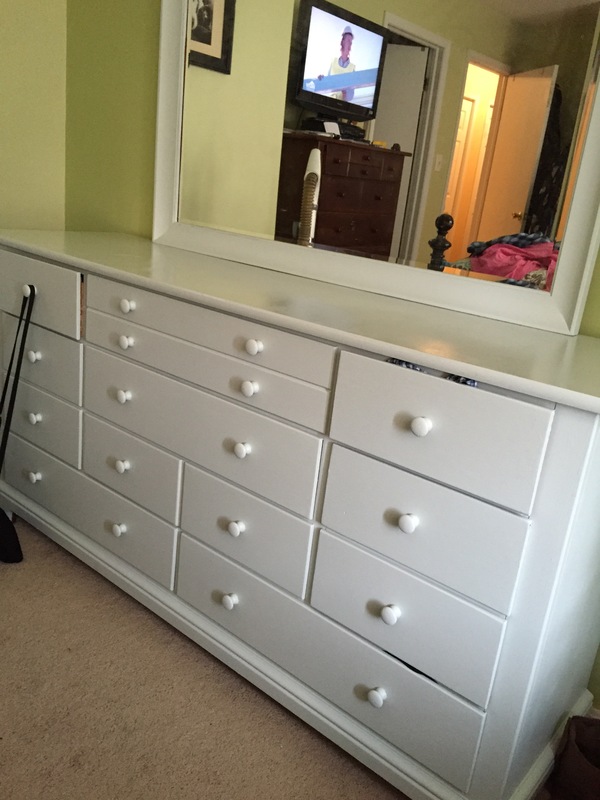 I took the top and painted it with a couple coats of the white on the underside of the top. Then when dry I painted the top with the Hurricane color and let that dry. I applied a crackle medium (Crackle Extreme by Maison Blanche) and that sat for a month or more waiting for me to finish it with a top coat of Maison White. I added the top stencil after the white paint dried and I sanded a bit as there were a couple areas that felt lumpy- probably from the crackle medium where it was put on a little to think by yours truly. I finished the top with three coats of varnish. I spray painted the carts big looking wagon wheels with blue Rustoleum Paint. I had two very nice days in the last few weeks that allowed for me to spray paint in the garage. The small wheels and drawer pull I painted with a hammered metal finish spray paint also by Rustoleum. 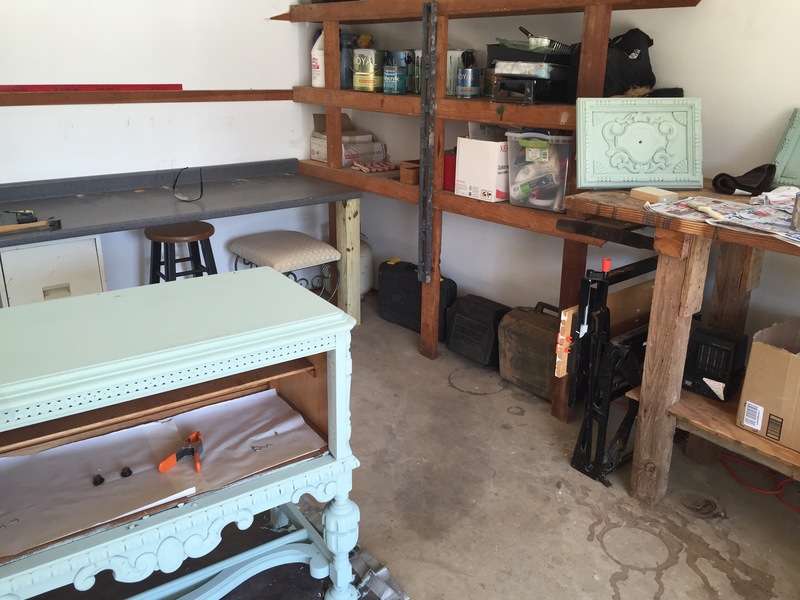 I put everything back together and Voila…a new trendier tea cart. Every time I tackle a new painting project I learn something. This time I learned that you can take your sweet time doing something and not stress about it. I really enjoyed the process. The other thing I learned is that if you make a mistake- I make some each time I work on furniture piece – that you can undo most of them. Paint is more forgiving than I thought. AND if I end up hating the entire thing I can always start over! I showed my sister-in-law the finished tea cart and she loved it. I asked her if she would like it back – but she didn’t have room for it. I am glad bc I sort of become attached to these pieces as I work on them. This will not bode well if I keep accumulating furniture as we have a small home and not much room! I have no idea as yet where I might put this cart. And if I ever want to sell anything I paint I will need to release my feelings for them and let it go out into the world. 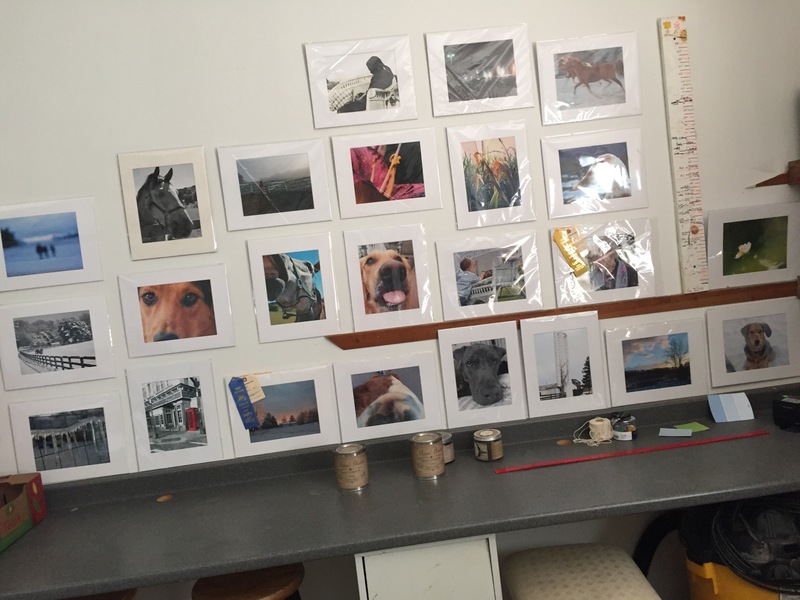 I have had to do this with photography as I have sold a few of my photos lately and at first it was a little hard to see them go but now I am glad someone somewhere has an “Anne Sweeney” on their wall. I have always longed to be creative because it was what my heart told me to do. I fell in love with photography early in my 20’s. After I got that bug I never looked at the world the same. Every field became a scene for a photo- I looked at the light in a new way. I began was writing as a kid and I journaled my way through high school. My favorite part of my job way back when I was a programmer/software engineer was creating the processes which drove the program. For me art is a form of therapy – its a way to pour my feelings into something- I get something back from it as well. And I when I share my creativity it may inspire or effect another person. I have been wondering why I have such a hold on some of my art. I write (and that is a form of art) and I send that out into the world freely and I share my photos all over the internet where anyone could claim them I suppose. So why did I feel such a hold when it came to selling them in a frame- the original is not really anywhere except as bits and bytes on a computer why was it so hard to put them in a frame with a price tag? And now furniture? Why I am feeling so attached? I need to ponder on this a bit more because I think the answer is important for me to know. In the meantime I will keep doing what I do bc it brings me joy. Whew! That painting project was quite fun and tiring! 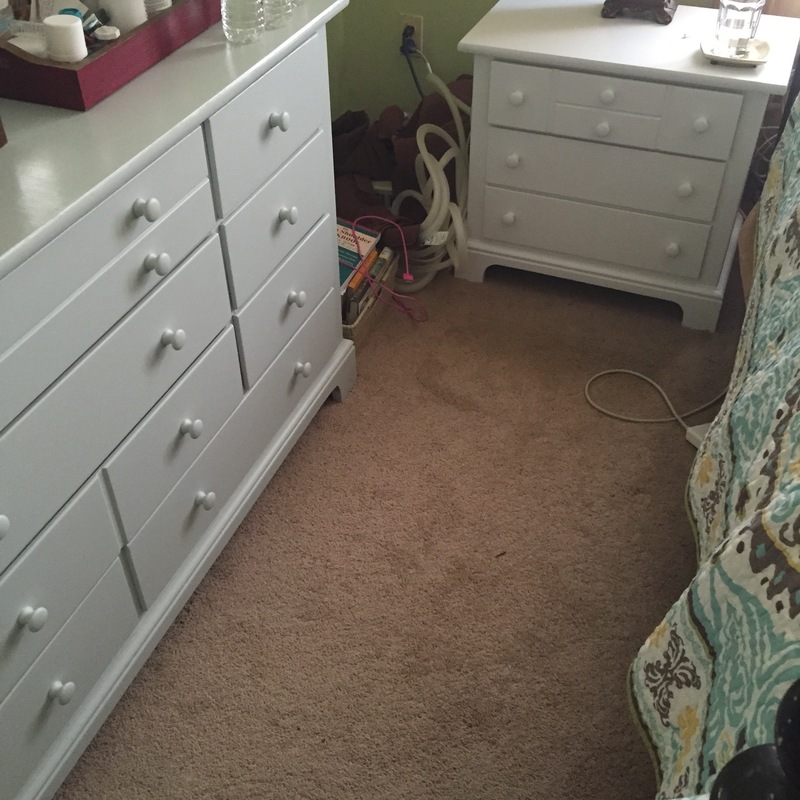 The bedroom set still has one piece left to go but since 3/4s are done I decided to share the results thus far. Read Part One of this series here. So when I left you in part one of this saga I noted that I was in the thinking phase of the project for much longer than my normal thinking usually goes. I have been known to be impulsive in my life and this is something I have tried to fix. Being impulsive isn’t bad all the time but I am finding thoughtful consideration is often a better way to approach things that are new to me. 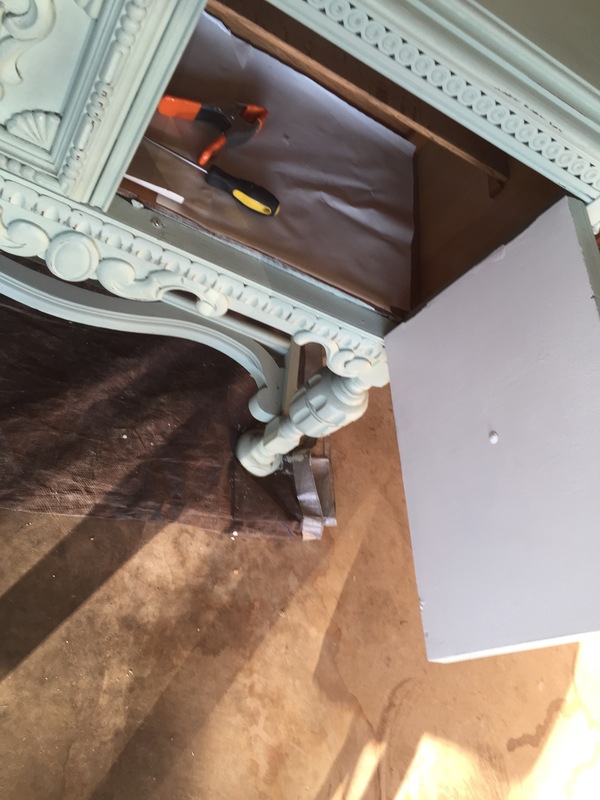 Though I had painted outdoor furniture before I was not concerned about sanding and finish as much as I was with the bedroom furniture that we’ve had for over 15 years – I wanted it to look good – so I think planning it out (maybe procrastinating) was ok. I read up on painting furniture on the internet and realized I had a lot to decide. Sanding or no? Paint sheen – Satin, Semi-gloss- or glossy!? Would I need a poly coat on the top? 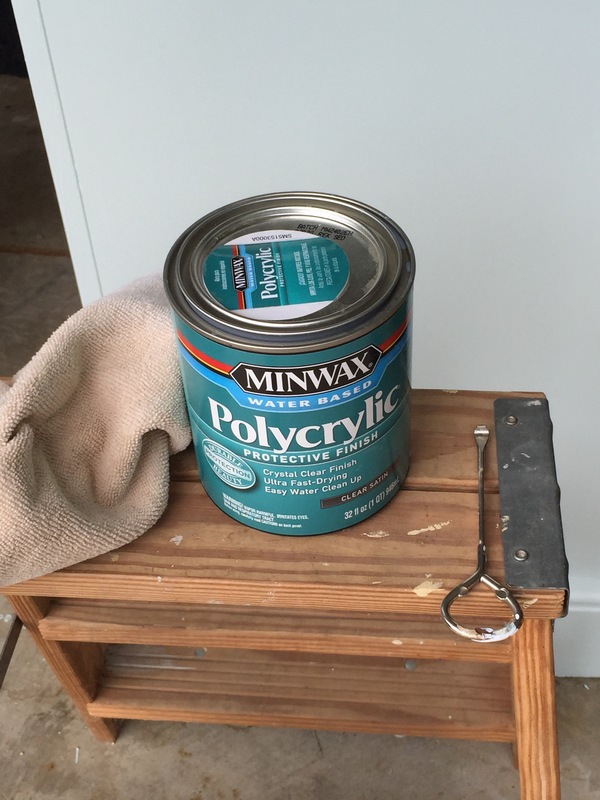 The poly coat question didn’t even surface until I was reading about proper sanding during a break in the project. I have to put a poly coat on? Really. But I decided that yes I should do this since the furniture will be home to water glasses and contact lens solutions and face creams. So that would delay getting the project done by a day but I am trying to learn patience. Normally I would have just blown off this step bc I would have wanted to get the project done fast. This time I was willing to wait. 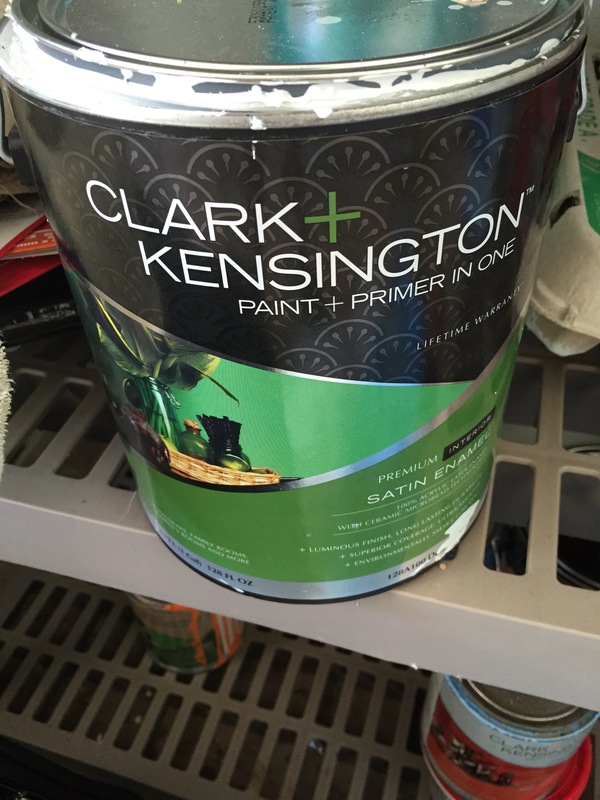 In the end I chose to use a satin paint by Clark and Kensington. I got this from our local Ace Hardware. I like to use our local small shops when I can and I have been having them mix paint for me for years. I chose Designer White and Drift for my colors. I wanted the bulk of the pieces (4) to be the white but I wanted one to be different. 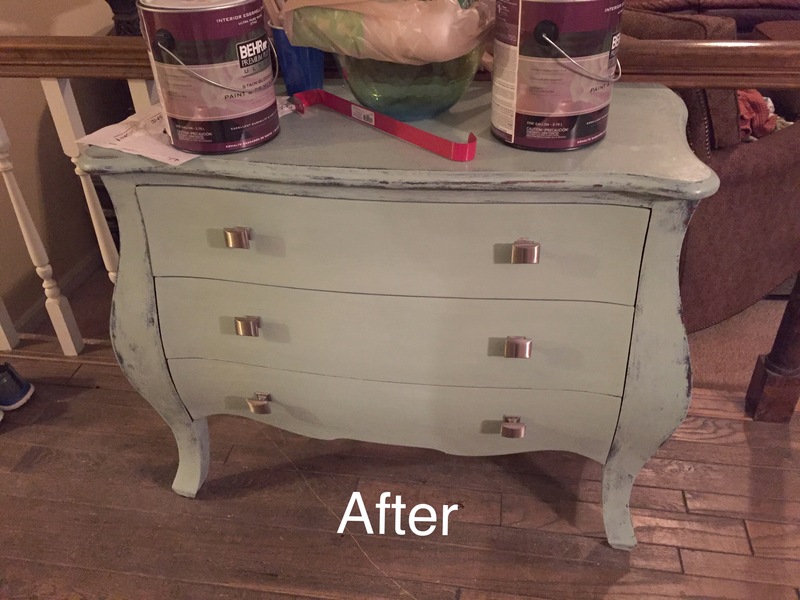 I chose to paint my dresser the Drift color. I went with satin at the advice of the sale person at the store. I had wanted Semi-gloss and in hindsight I think I might had liked that a tad better. But just a smidgen. As I set off to work I had help. 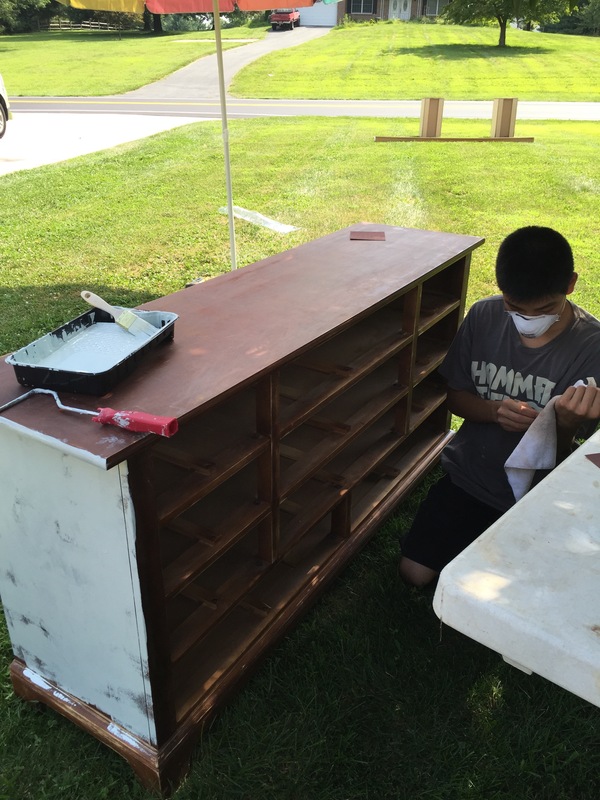 My son Ozzy, as he is know to those of you who read my blog, was very eager to help me with the sanding and since we were planning on doing two nightstands and my large dresser there was a good amount of sanding. His efforts were rewarded with an IPod shuffle- which he has since gotten and I haven’t seen since. (His last one took a swim with him in the ocean and did not survive – so I am hoping this new one – which was given to us for free- is still with us. ) I will just say this- having a helper with a project like this is really a plus. He saved me a lot of time. Kevin helped paint between doing other projects that are needed on a regular basis around this farm. Painting is really taking time off from the real stuff that needs to be done here! So I guess this was a vacation for me! I wont go bore you with the stroke by stroke details but I have a couple things that are of note- I had to water down the Drift color -maybe it was the air temp that first day when I began working but adding water created a more forgiving paint. I also learned that rolling was better for me. I used a foam roller and I had brushes for details. I learned to use a light touch with the brushes. 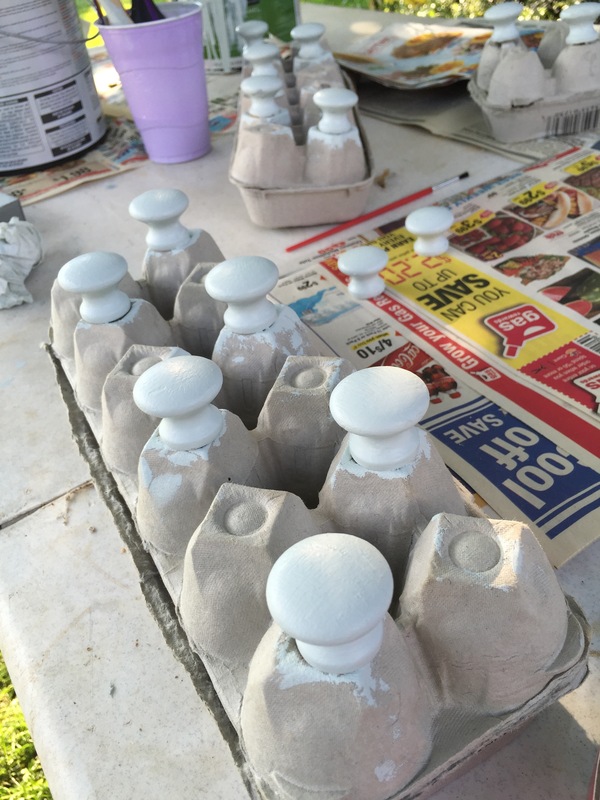 I also realized early on that I was going to need 3-4 coats of paint – so again my patience was being tested. Getting good brushes is a must. I spent a whopping $20 on my brush I was going to use for the poly coat…and I am hard on brushes but with that brush I treated it like a baby. I plan to keep that as my topcoat brush for some time(I hope). 1-I am a messy painter. Worse than when I paint walls. It was all over my feet legs hand and clothing. It was on the driveway and on the garage floor. I had it on my leg when I went to church on Sunday- yes I bathed. I tried to be neat and yet it just doesn’t happen for me. I had it on the bottom of shoes and then went to bare feet and stepped in it. Really I am like a child and I suppose I should just embrace it. I tried very hard not to get snippy with anyone but alas poor Ozzy got a few snaps at him but he is pretty understanding bc he certainly has his moments – so he had some grace for me. 3. I added water to the paint – as I mentioned above adding water to thin out the paint is good in that it allows the paint some viscosity to smooth out. I felt bc of the hotter temps that the paint was getting gummy quickly on the surface. This was on a warm day with low humidity. 4. Egg crates make great knob holders. – My husband is a genius. We had to paint the knobs and that was a pain. He brought out egg cartons (we always have a bunch bc of our laying hens) and we kept the screws in each knob and stuck them into the crates for painting and drying. 5, I hate humidity- on day 2 the humidity was brutal and if I could have moved the operation indoors I would but there isn’t room in the inn for that big dresser. So I sweated it out in the steam. 6 . Patience- I am trying to learn it and sometimes I surprise myself and actually achieve it – maybe for a short period but I do. 7. Sanding before and between coats – I had never taken the time (see #6) to sand before. This time my son did the initial sanding and between coats I sanded the piece using a fine grit sandpaper. I wiped it off after sanding and then applied the next coat. 8 . I read about doing a top coat as I mentioned above. I decided to go ahead and do it and I chose to use a polycrylic. It has low fumes and is easier to use. I bought a very nice brush (2.5 inches) and I put it on in thin coats. I think the top coat will help protect the piece. I need to learn how to apply it better- I was not very good at evening out the coat from on side to the other – but for my first time it was pretty good. 9. Mistakes will happen. I was being pretty picky about this project – I really wanted to do a good job – but mistakes do happen. 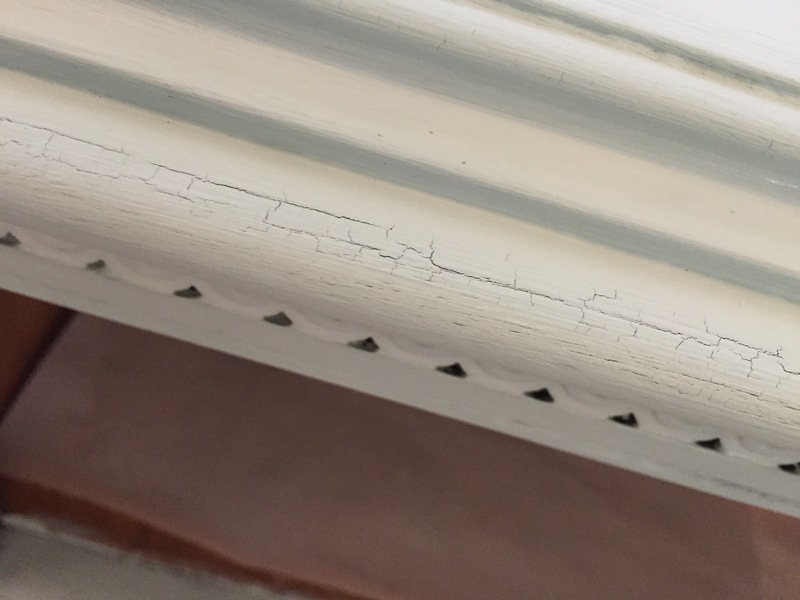 I had a big issue where I went to sand off a lump and it tore off a large piece of paint down to the wood. 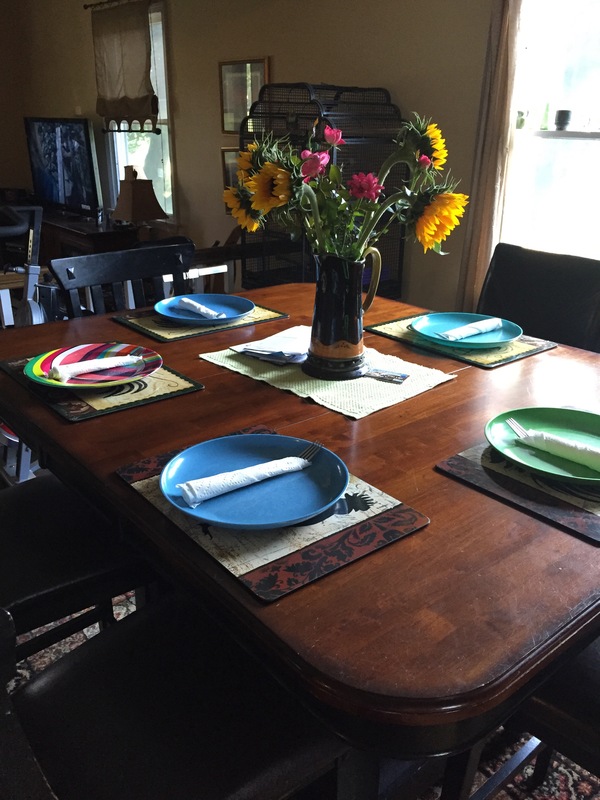 I stayed calm – maybe I was delirious bc of the heat! I wasn’t sure I could fix that but I kept going back and painting over the area and was able to get it to a point where it is hard to see. I know its there but I am ok with it. I just realized I am not going to paint to perfection and really the stuff looked much better and a little imperfection is ok.
10. I had fun. I learned a lot. I had fun and learned so that was great. I will not paint in that heat again. 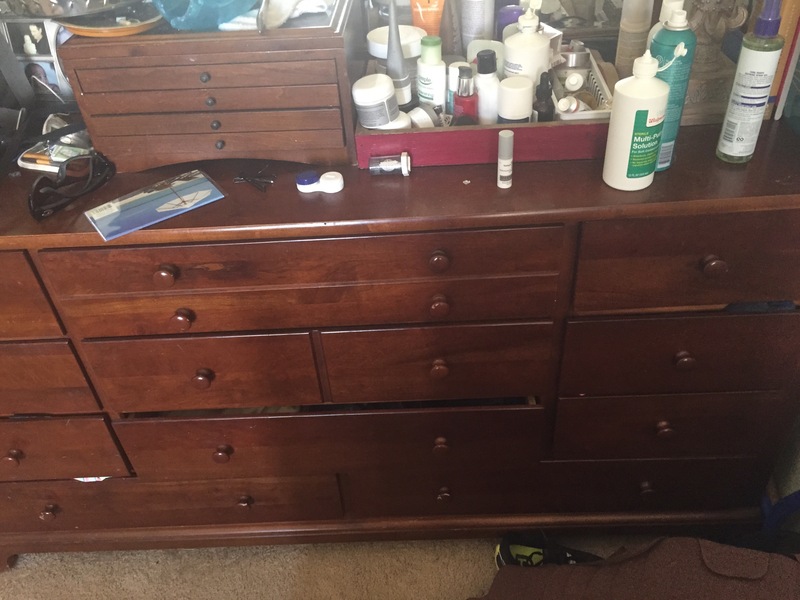 Well…we still have the high dresser so maybe I will have to be in the heat again. Or maybe I can set up in our entry way. It will be tight. The messy factor worries me about this idea – see #1 above. 11. Our room is cute! Its beachy! My daughter doesn’t like the bed by the window- we re-arranged things since the furniture was out of the room. I like it so far there is more room on each side of the bed – and the windows are so cloudy bc they are so old so we aren’t losing a great view. Its a nice cloudy view! We will see- we can always move it back…but she did like the furniture! 12. I have sore muscles that I didn’t know I had. Yes- I do! But worth it! 13. Next time I will take on a piece at a time and complete it before I move onto another. 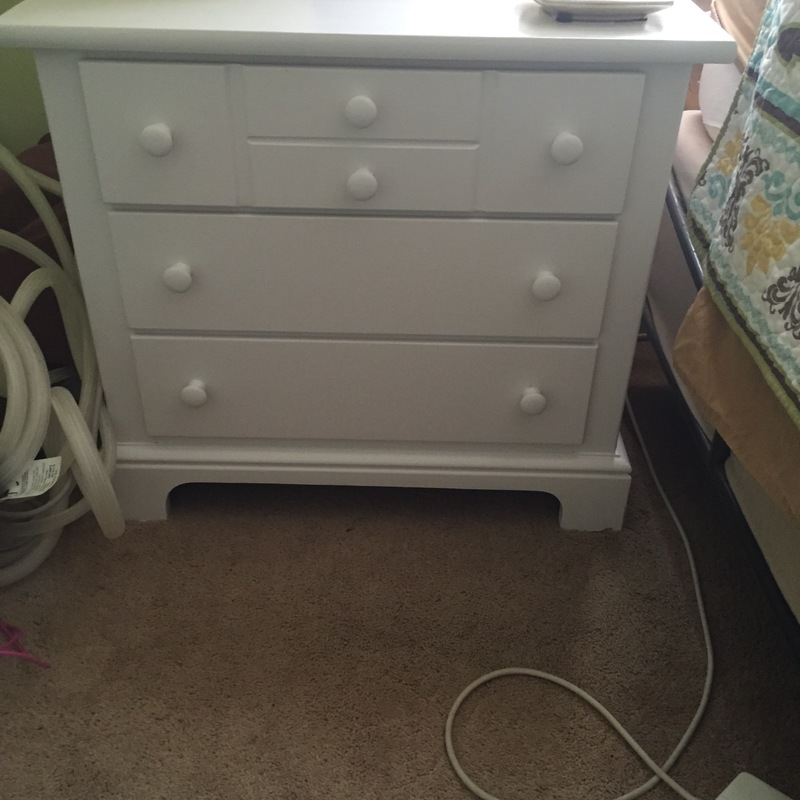 This time I was working on three pieces at the same time..Dresser..nightstands..it was a a lot! 14. I have too much stuff! 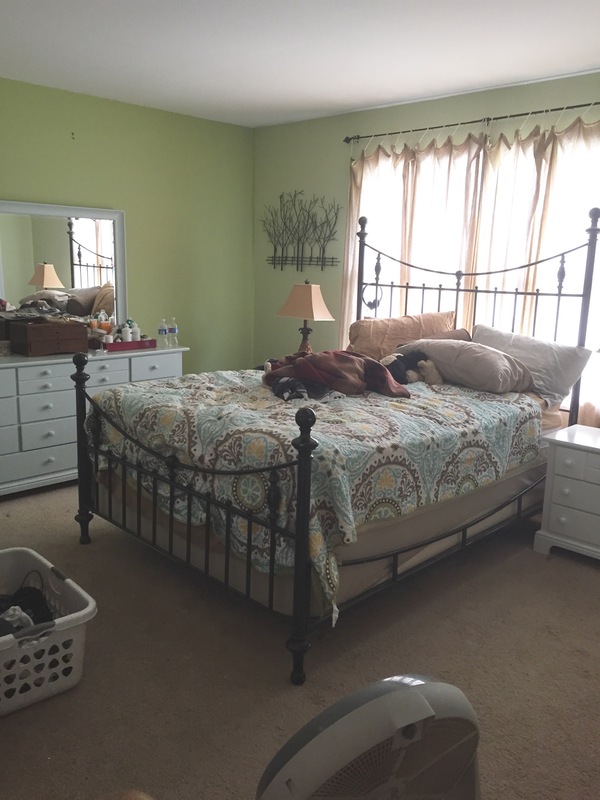 I was able to get rid of some stuff and it felt great. I have more to go though but a step at a time. 15. Lastly, I am just very happy that I had the stamina to do this job. After my radiation treatment was over in 2013 it took many months to get my stamina back. I could not have taken this on last summer and I am glad my bum shoulder was cooperative and my nerve damage didn’t flare up too badly. It also felt good to have the mental drive back to want to do this project. I was in a funk for quite a while so to have this spark was truly awesome. 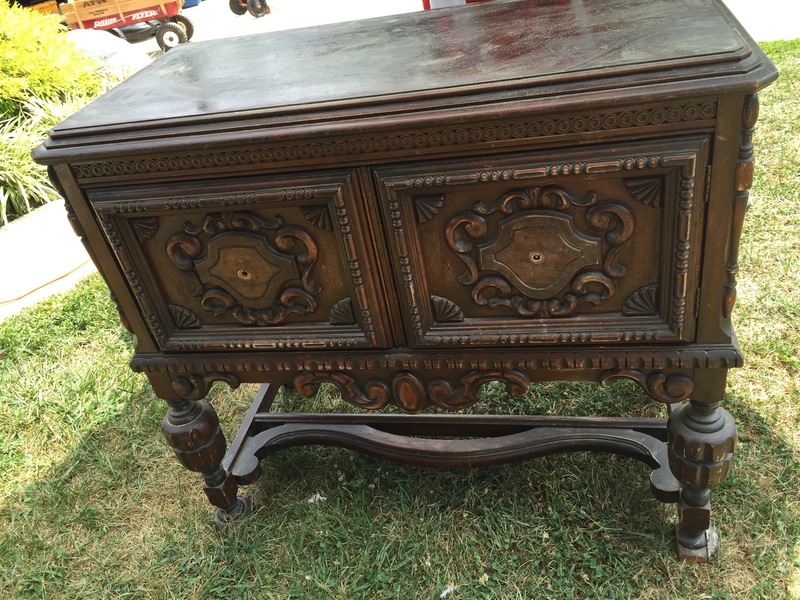 I will be doing my husband’s dresser next and then I have my grandmother’s hutch in my scope. I am determined to renew my tired stuff. Maybe with each project I will get better and better- but if not I think I will have fun trying. It might have been a new hobby founded out of desperation but I think I like it!